The Potters are continuously underestimated by the bookies at home to big clubs. 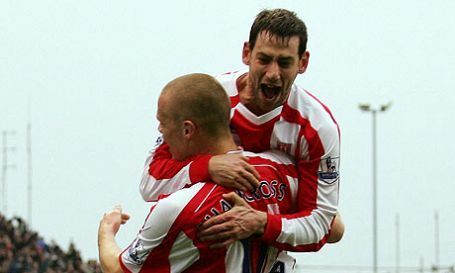 Not long ago Stoke were scoring 4 at Goodison Park and beating Chelsea, Man City and Man Utd. They'll bounce back very soon. If you scrap their first six winless games this season, the Potters would be top four and fighting for the title as much as Leicester. If the season had begun at the end of September then Stoke would be in the top four right now. Stoke will fancy their chances against the crisis-hit champions but they have the bluntest attack in the top flight themselves. Stoke have won 4 of their last 5 in all competitions while the league champions are in full blown crisis. Last season both these sides won their home matches against each other. Garry Monk has just a few more match winners at his disposal. Both teams are in totally false positions which can be explained upon closer inspection. Expect the Potters to get back on track. The odds seem backwards for this one given that Stoke are a grizzly top ten team while the Canaries are new to the party. Of course it won't be 6-1 again, but Stoke are still the most obvious betting selection of the weekend at the price on offer. We're following some pretty compelling form lines in the Championship and chucking in Stoke City for good measure. The Potters can equal their joint best Premier League points tally with victory over inconsistent Spurs. Dismissed by many as boring route one exponents. But are the club from the Britannia actually a gift bestowed on shrewd football punters?